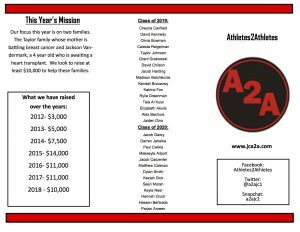 “Athletes 2 Athletes was formed in 2011 by four senior athletes in my class as part of a competition to create a business plan…they went above and beyond to turn their plan into action after they saw needs within the community that they could help with. Specifically their basketball coach at the time had a stroke and he need some things that insurance simply wouldn’t cover. Also, their English teacher had a niece and nephew both who suffer from a terminal illness and they needed help purchasing a handicap van and swimming equipment for the children. That year we were able to help both families. After they graduated I asked them if they cared if I continued to run the organization as a non-profit and just got new athletes to help every year. 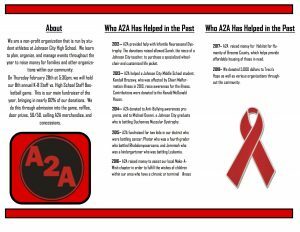 Since 2011 we have had over 100 athletes work for A2A. This year we have 29 athletes from various sports who plan and run a charity basketball game between the K-8 Staff and HS Staff along with lots of family activities to bring our community together. They set up Face painting, concessions, raffles, A2A clothing, halftime entertainment, 50/50, local mascots from professional and college teams, and many other things. This year we are mostly helping two families. One family the Taylors, have a mom who was recently diagnosed with breast cancer and have had lots of medical and travel expenses piling up. The Taylors have two boys in our baseball program one in 7th grade and one on Varsity. Secondly, a Johnson City police officers son who is 4 years old needs a heart transplant. The son is currently in NYC and he has to travel on his off days to be there. Those are the two main things. 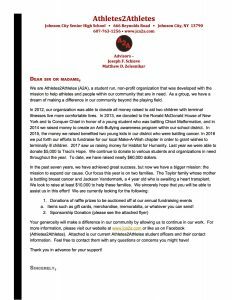 We also donate 1,000’s of dollars to local events to help raise awareness for causes. One of the young students we helped in 2011 passed away and we pay for shirts for a group of 20+ runners to run in her honor. We sponsor other fundraisers, donate food to students/families in need, buy Christmas presents and so many random things I wouldn’t have time to write. This year our big game is on February 28th. We actually for the first time have 2 police officers playing in the game as well as the Broome County Executive Jason Garnar playing. Out of the 29 student athletes participating they put in between 30-60 hours each depending on their position within the organization.